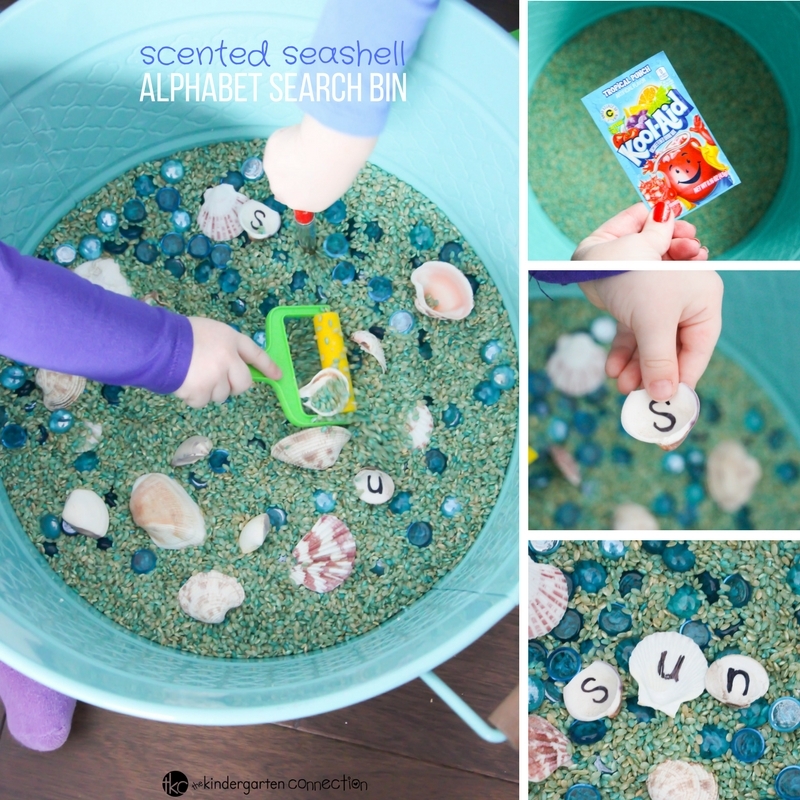 As the summer gets closer, my kids and I are equally anxious for lazy beach days so I thought a Tropical-scented Seashell Alphabet Search Sensory Bin would be a great way to close out the year. 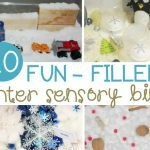 Sensory Bins are a favorite among teachers and students! 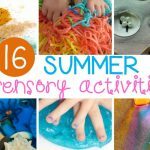 This is such a fun sensory bin to add to your sensory table as summer draws nearer and conversations start turning towards fun summer plans. 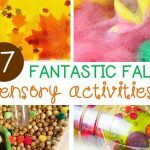 While some families may have elaborate or unique plans, nearly all of the children can relate to either splash pad or beach visits, so it’s a great go-to sensory bin that can be offered year after year. 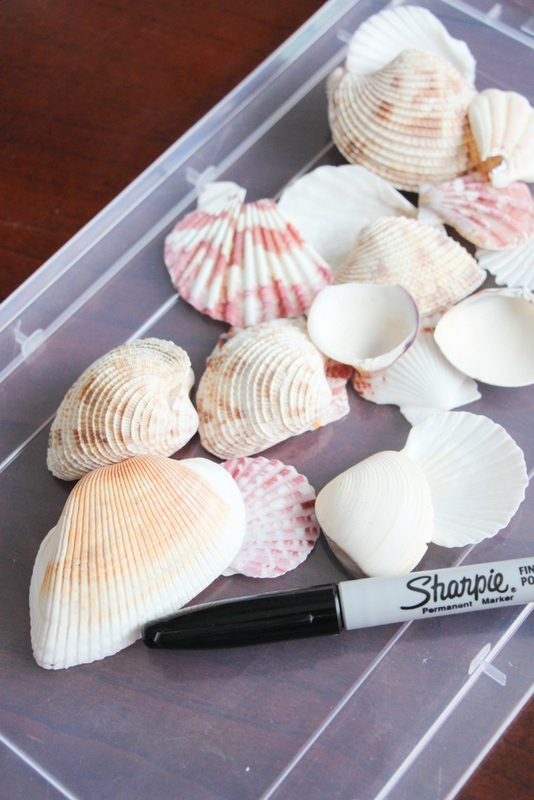 I found collections of seashells at our local dollar store, along with those blue glass beads, but you can also print out clip art of seashells, write the letters on the back of the paper, and laminate instead if you don’t have access to cheaper seashells. To make your tropical scented rice, start by placing half of your rice in a large glass or metal bowl. Mix your flavor extract and Kool-aid OR blue food dye in a glass cup until you reach a deep blue saturation. Add a couple Tablespoons of the blue liquid to your rice and stir well. Add in extra food dye as needed. Pour the rice out of the bowl and onto a baking tray or large storage bin. Smooth it down to a flat, even layer. Repeat with the remaining rice and let it dry for at least 2 hours. Meanwhile, go through your seashells to ensure none are broken and use your Sharpie to write out the alphabet on the backs. 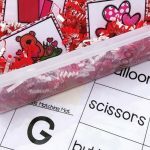 Be sure to include at least two sets of vowels. 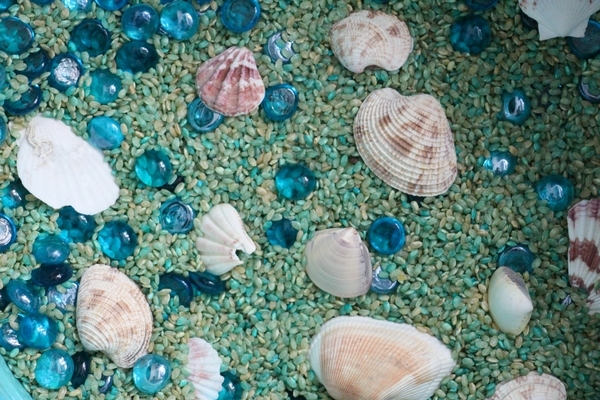 When the rice is dry, add it to your sensory bin and stir in the sea glass and sea shells. 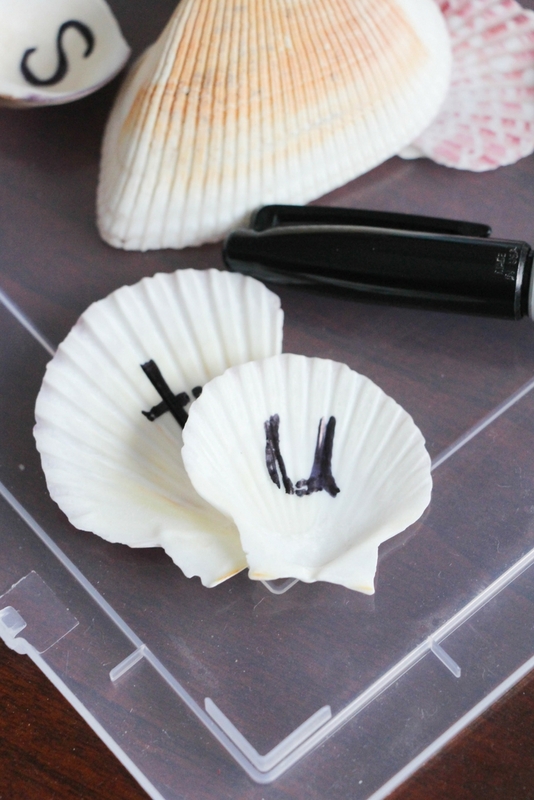 I made sure all of the seashells were facing up (the letters hidden) to provide a fun surprise for the kids. Set out the scented sensory bin with various beach tools and encourage your kids to get digging! 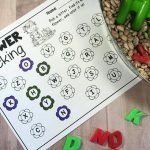 My kids were so excited at this delicious-smelling tropical summer sensory bin and when they started discovering the letters on the backs of the seashells they were even more excited and quickly set about identifying the letters and seeing just how many they could dig up. 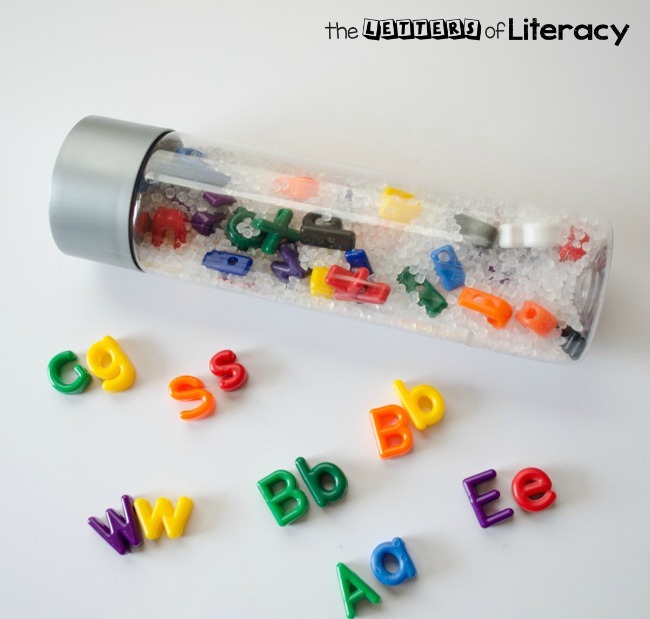 The children that are starting to build words had fun trying to assemble the letters they found into simple words. 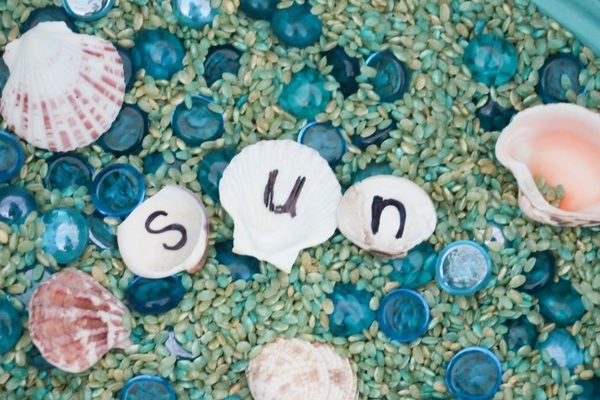 It would be great to post a list of simple words for the kids to search for – like sun, ant, sand, etc. 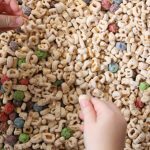 This easy sensory bin involves a bit of a time investment in labelling the seashells and dying/scenting the rice, but it can be stored and used year after year. 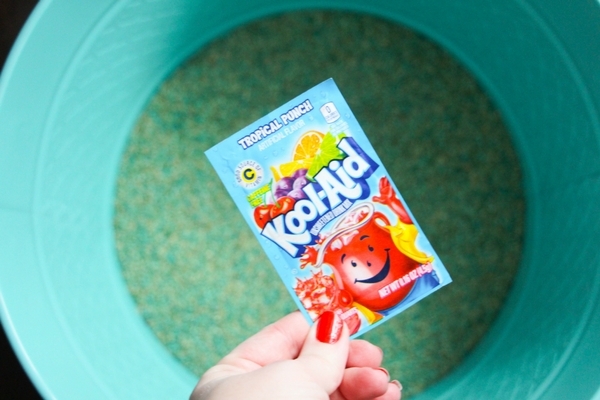 Just stir in some fresh Kool-Aid powder or coconut extract when you take the rice out of storage to bring that delicious tropical scent back. This sensory bin would pair well with our Summer Beach Yoga for Kids – which can be done anywhere! 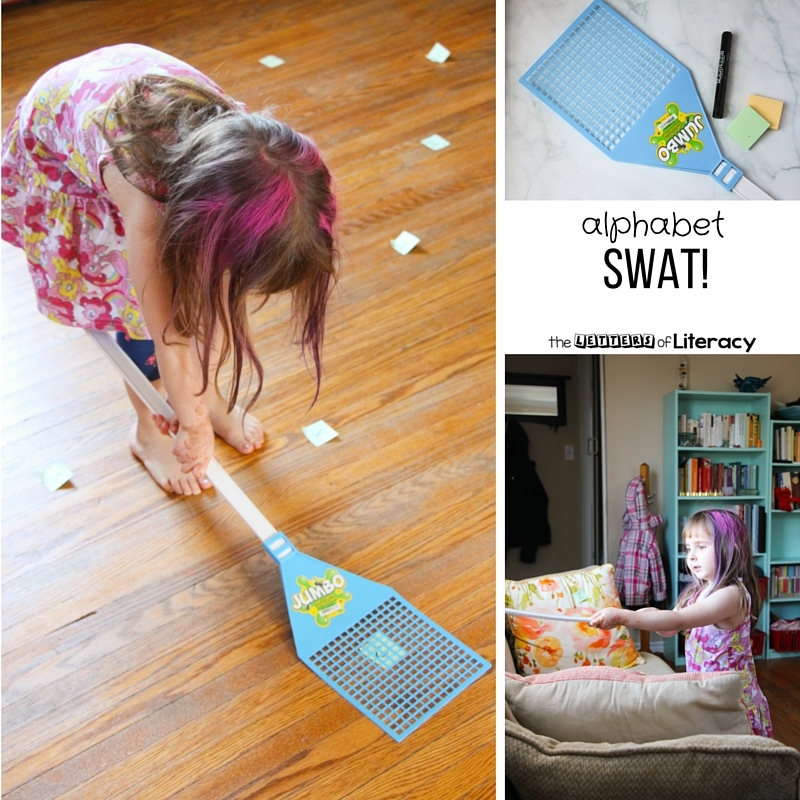 Looking for more fun ways to learn the alphabet? 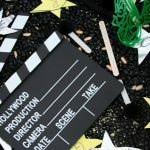 Check out some of our favorites activities and resources below!